Simon & Schuster/Paula Wiseman Books, 9781481461542, 32pp. A charming picture book about a lost giraffe and his new friend who helps him find his way home and see the world from a new perspective. Bertie the giraffe’s life is very simple and predictable: every day, he and his herd nibble leaves, sip water, and nap. But one day, Bertie oversleeps and wakes up lost and alone. Well, not quite alone—he meets Blue, a lonely blue giraffe who offers to show him the way home. On the way, Blue has a lot to show his new friend about the wonders of the world that Bertie had never noticed before. But when Bertie gets home, will his herd welcome Blue, even though he is different? Filled with lyrical text and irresistible illustrations, this sweet tale about friendship teaches young readers about embracing differences and celebrating new perspectives. Litten(Bike On, Bear!) delivers a deceptively simple story that celebratesindividuality, acceptance, and friendship. Bertie and his fellow giraffes—withtheir long necks and rounded bodies, they almost look like a row of eighthnotes or soup ladles as they nibble leaves from tall trees—follow the sameschedule every day. Having overslept one morning, Bertie wakes up alone andlost, fretting about how he’ll find his herd, until he encounters a giraffe“who was just like him—except he was blue!” (Bertie and his brethren are yellow. 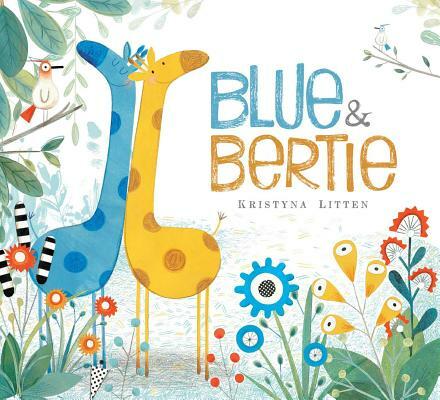 )As they travel together, Blue shows Bertie a world of vivid flowers, unfamiliarbirds, and a rushing herd of zebras, sights he’s never seen before. AfterBertie rejoins his herd, Blue (who fears he won’t belong) is instead accepted“just the way he was.” Closing scenes that show the giraffes amid the colorfulbirds and flowers Bertie previously discovered underscore Litten’s messageabout the value of breaking outside of one’s comfort zone—and getting to knowpeople who don’t look exactly like you. Ages 4–8. Bertie is indistinguishable from the other yellow, spotted giraffes, both in appearance and behavior. His existence is so routine that he panics when he finds himself alone and having to make decisions on his own. “What should I do?” he says as he paces around a rock. A blue giraffe sees Bertie and offers to show him the way home. But Blue introduces Bertie to far more than the path home. He teaches him about birds and rare flowers that live among them, and he encourages him to feel free. In return, Bertie gives Blue friendship and a home where he can feel accepted, even though he stands out from the herd. The simple artwork is expressive and engaging. The text, which rhymes at times, adds emotion and heart to characters who are already brimming with personality. VERDICT A sweet, empowering story to share one-on-one or in a story time. Kids will embrace Bertie and Blue. celebrates differences and shows how enriching diversity can be.